The Weather Guy: Where is the sunshine? Saw a story last evening on Channel 2's website that Tennessee has had the most tornado deaths in the last 10 years. 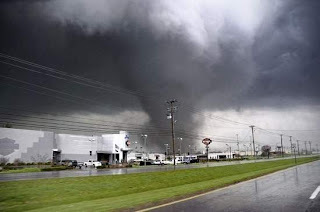 Speaking of tornadoes, an excellent YouTube video below of the Murfreesboro Good Friday tornado. Below the video is an incredible photo taken of the storm. I said yesterday we'd see a sunny day today...well, sometimes in this weather business, things don't go as planned. The clouds have been very stubborn and will continue to stick around. Folks in West Tennessee will have the best chance to some sunshine today. Nashville area will see a peek or two of sun by later this afternoon. Here in Cookeville, I think we'll stay mostly cloudy throughout the afternoon. Let's hope I am WRONG! A further look into our forecast shows sunshine for Thursday with highs in the mid 60's and more sun for Friday, highs in the upper 60's. Rain possible for the weekend. 1910-Waynesboro in southern Middle Tennessee measures 6.94" on this date..a station record. 2001-Strong winds topple WGNS-AM tower in Murfreesboro. Built in 1946, it was 328 feet tall, making it the tallest structure in their city. Replacement cost is between one-quarter and one-half million dollars.